Google usually celebrates holidays and other special occasions with a Google Doodle, but they went beyond that for Halloween this year. 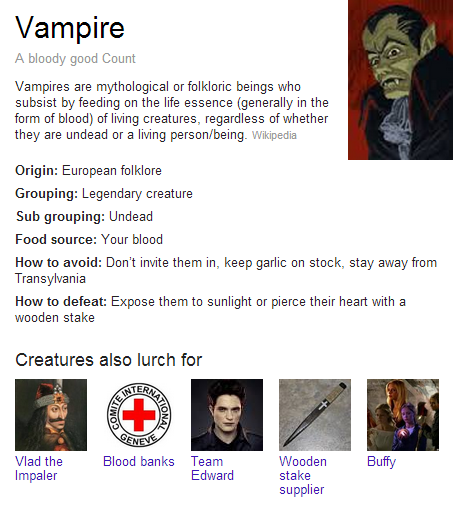 Knowledge Graph answers now pull up fun results for popular creatures of the night. Google has always aimed to become more of a knowledge engine than a search engine. They have been constantly updating their algorithms and processes to mimic human behavior when searching for information, and have been encouraging companies to change their online marketing strategies to benefit their users. Knowledge Graph has been providing richer, smarter, more informative search results since May 2012. It helps users find the exact information or links they’re looking for without much effort, and even allows them to discover new things to expand their inquiry. 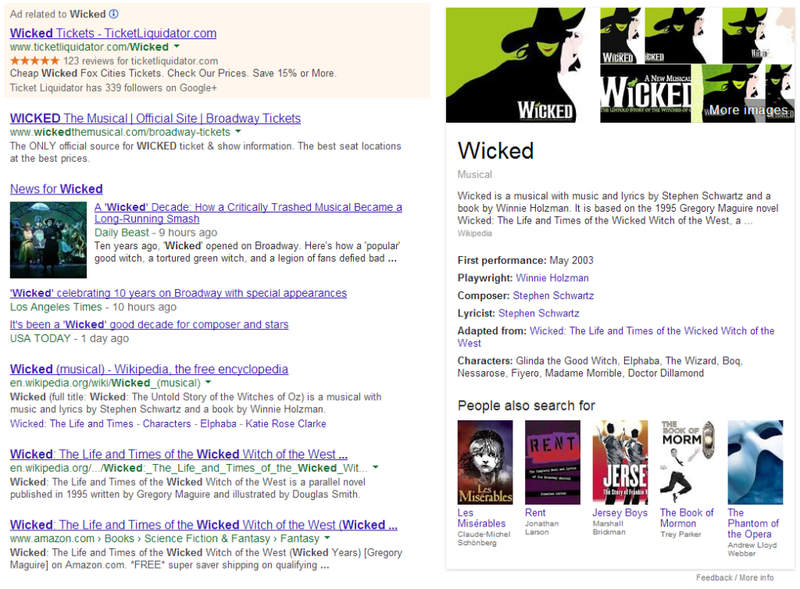 For example, Google’s Knowledge Graph already knows that most people who search for “wicked” want to know about the musical and not the actual word, and their search results pull up relevant information about the musical. 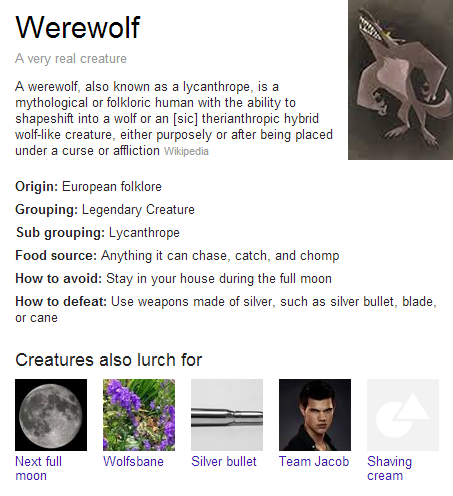 Google seems to have customized search results for creatures commonly associated with Halloween. 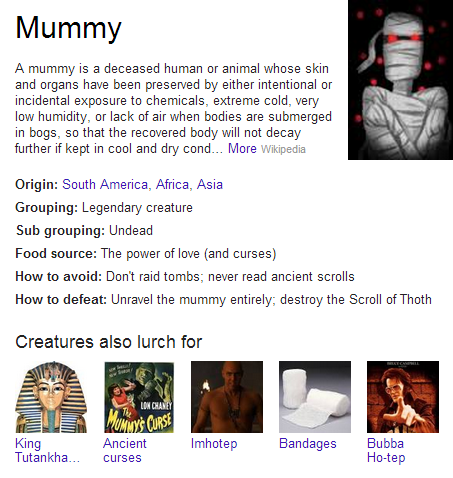 Mashbale discovered that searching for terms like [Ghost], [Witch], [Skeleton], [Grim Reaper], and [Zombie] all pull up a fun summary box with information on the creature’s origins, food sources, and effective ways to avoid or defeat them. 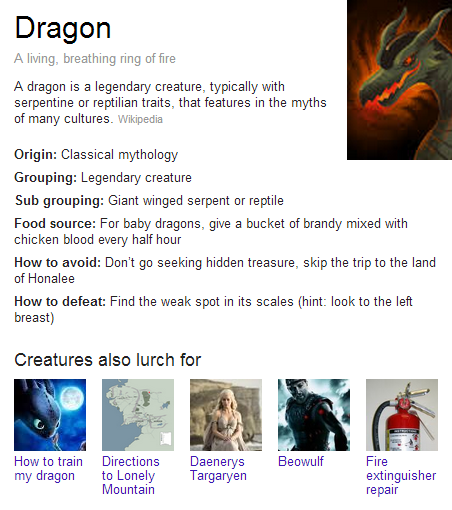 It’s also funny how some the “People also search for” section changes to “Creatures also search for”, and how they include some sillier recommendations, like “fire extinguisher repair” for [Dragon] and “Shaving cream” for [Werewolf]. Google has accomplished a lot of things and keeps striving to provide better products and services for their users, but they always know how to have a little fun along the way.